Can we call her a tippler? We can’t say which lessons Paula Deen learned from her recent “is it racist” scandal, but maintaining a sense of public decorum doesn’t seem to be one of them. That’s OK, though; subtlety has never been her style. 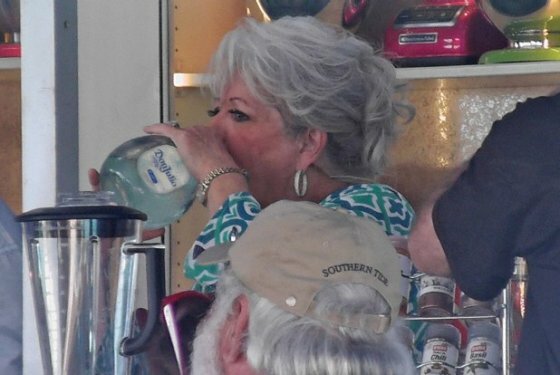 Deen recently made her first post-scandal appearance at the South Beach Wine and Food Festival after securing $100 million for Paula Deen Ventures, which will focus on selling her own material and original content rather than licensing her name and likeness to others. While Deen probably won’t appear on The Food Network or score any big-name endorsements anytime soon, she still has an extremely dedicated following—and many of those fans used her moment of weakness as a Duck Dynasty-style call to arms. According to PDV’s new CEO, her Facebook fanbase has doubled over the past year while her magazine subscriber list increased by 40%. She also retained a couple of her less valuable sponsorships.